It’s got a pig on the front, which is great because it reminds me of how much I liked the Charkoota Rye beer by New Holland that was in the very first smokebeer tasting that The Ministry ever held. However, these beers are fairly different. 17ST Smoked Amber Ale is brewed with malted barley smoked over cherry wood. Once poured into a glass it held a decent brown-amber color along with a noticeable smoky smell (smoked pig) with staying power. The taste is a little watery which could also be described as thirst quenching, making it a great refreshing beer for hot Houston summers. Recommended dosage: Two bombers. I don’t have to be challenged every time I drink a beer. Overall Happiness rating: 4 out of 7 Smokestacks. Brewer’s Description Our Smoked Amber Ale, created and brewed for us by Big Muddy Brewing in Murphysboro, is now available in 22 oz. bottles in liquor stores across Illinois and select states. Brewed with hops smoked over cherry wood, this beer was created to complement barbecue. 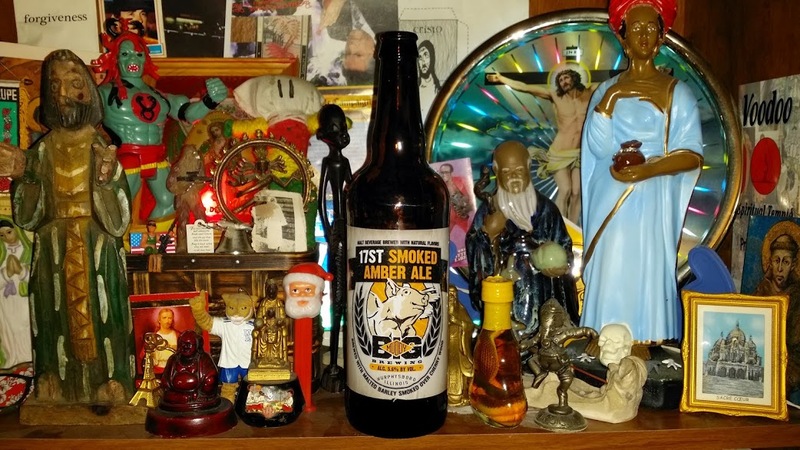 This entry was posted in Beer, Educate, Enlighten, rauchbier, Smokebeer and tagged 4 - 5, ale, amber, Big Muddy, cherry wood, Illinois. Bookmark the permalink.